The North Carolina Coastal Federation sent a comment letter Monday to Sara Burroughs of Sage Design, the Wilmington-based firm leading the planning process for developing the 300-acre addition to the mainland access of Hammocks Beach State Park. Todd Miller, the executive director of the federation and Sam Bland, a coastal specialist with the federation and former superintendent of the park, signed the letter that included the federation’s recommendations and development concerns. The planning process began in August 2016 and will last into Spring 2017. Learn more about the planning timeline here. The 300-acre addition is a forested area home to critical habitat for native plants and animals, including the painted bunting, a federal species of concern in North Carolina. Nearby residential development has led to loss of habitat on the existing mainland area. The property also consists of wetlands that absorb rainfall and prevent flooding. There are also five tidal creeks that serve as nurseries for finfish, crustaceans and shellfish. Disturbing the wetlands and tidal creeks will result in flooding, a higher volume of polluted stormwater that flows into Queens Creek and loss of estuarine habitat. “Any development of the 300 acre addition to Hammocks Beach State Park should be carefully considered and limited to low-impact activities that preserves the natural resources for which the purchase was intended,” Bland said. Because of the potential negative impacts on the shoreline salt marsh habitat, the federation recommends that the park continue to build living shorelines. 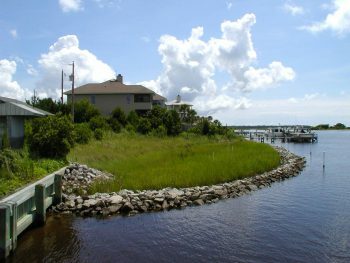 Living shorelines protect salt marshes, trees and shrubs and estuarine habitat all while preventing erosion. The park has already built a living shoreline on part of the mainland shoreline and on Jones Island. These living shorelines have proven successful and productive. The letter also notes that past excavations on the property “have demonstrated that the Hammocks Beach peninsula was an important village site for Algonquian Native Americans,” and included burial sites. The potential impact on the historical sites would need to be considered before any disturbances. With these concerns in mind, the park should consider low-impact development that won’t drastically alter the current landscape, including hiking trails, primitive camping, picnic trails and educational resources that can be accessed by the existing park roads. Read the entire comment letter here. For more information about the federation’s comments on the development of the 300-acre mainland expansion at Hammocks Beach State Park, please contact Sam Bland at 252-393-8185.